We've known about Cedar Trail for quite a while now, the next iteration of Intel's Atom processor line. As far as the CPU is concerned, not a lot has changed from the previous generation Pine Trail. Cedar Trail is manufactured on Intel's 32nm process technology, but the CPU architecture is still in-order. You can read more of our Cedar Trail coverage in our initial look at the platform. It's taken far longer than expected, but we finally got someone to send us a Cedar Trail netbook for review. That someone is ASUS, and the netbook is their 1025C. We'll have our full review in the future, but in the meantime we thought we'd give some quick impressions of performance and, more importantly, battery life during video playback. I'll cut straight to the chase with regards to CPU performance: it's largely unchanged from the last version, which means Atom N2600 still feels quite sluggish for many tasks. 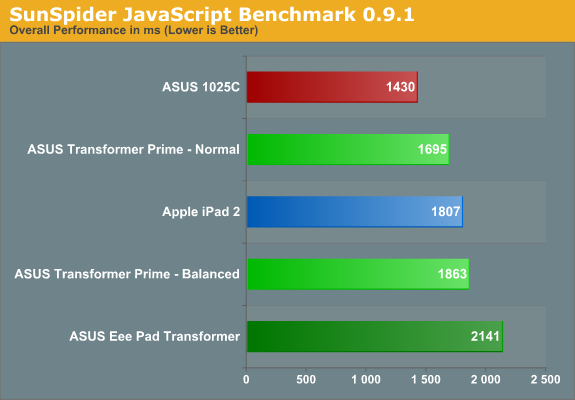 Atom is faster than ARM A9 CPUs, and you can see a comparison of Sunspider 0.9.1 with various tablets below, but for Windows 7 it's still painfully slow at times. The bigger change however is in the GPU, where the old GMA 3150 (itself a minor tweak to the even older GMA 950) is finally getting a needed upgrade. This won't turn Atom into a gaming system by any stretch of the imagination, but it does finally bring GPU accelerated H.264 decoding into the Atom ecosystem (without the need for a discrete GPU). What does that mean for performance? 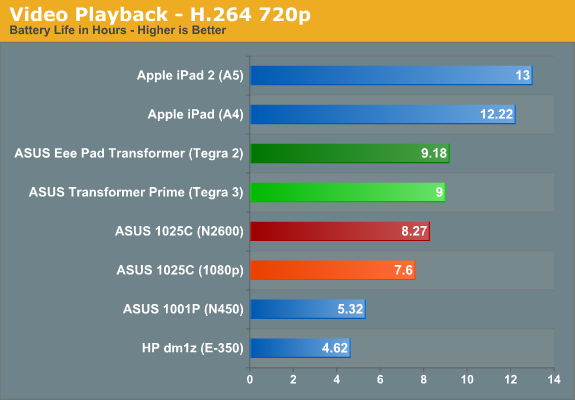 It means HD YouTube video can finally run without dropping a ton of frames—at least, the 720p videos that I tested played back without any major issues. 1080p video still experiences quite a few dropped frames, unfortunately, but then you don't need to stream 1080p video if you're using the integrated 600p LCD. Atom and netbooks in general still aren't going to set the world on fire with performance, but if there's one thing Atom can do well it's long battery life. Cedar Trail takes the previous Atom results and improves on them by over 50% in video playback tests. Tablets still generally do better here, but gIven that Cedar Trail now supports HDMI output, you could conceivably use an Atom netbook as a portable media player in addition to standard laptop tasks. I tested Hulu and Netflix on the 1025C as well and both worked reasonably well, but only with SD content. That's not an issue for Hulu, but Netflix HD content completely lost A/V sync. It may be that Hulu and Netflix are not currenlty recognizing the GMA 3600, but until this is addressed it's worth noting. There's still a question of whether a $300 netbook has a place in the market when we've got tablets to play with, but it's really a matter of intended use as well as price. 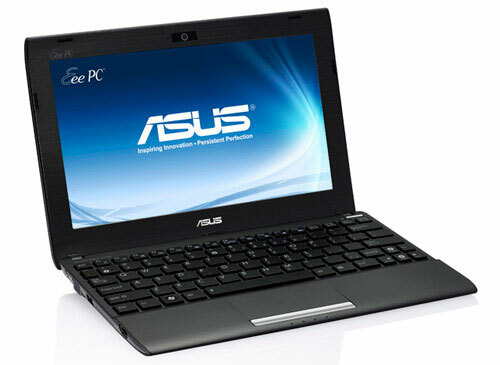 ASUS' own Eee Prime Transformer offers a better display and a nifty touch interface that easily surpasses the Windows 7 Starter experience, but if you're looking to do mundane tasks like basic word processing you'll need the keyboard attachment, which takes the final price up to ~$550—nearly twice that of the Eee PC 1025C. For basic typing, then, the price of the 1025C makes it a better choice, and you get excellent battery life that will easily carry you through a day of use and then some. Atom still isn't going to surpass AMD's Brazos for performance or GPU driver quality, but pricing and battery life still appear to be in favor of Intel's Atom, and 10.1" Brazos netbooks are pretty rarefied. We'll have our full review as soon as we can finish running the remaining benchmarks and doing additional testing, which might be a while. Hopefully we'll see equally impressive improvements for Internet and Idle battery life, but it took over ten hours to recharge the battery on the 1025C and eight hours plus for our video playback test, so basically I'm look at a full day for each battery test cycle to complete. For anyone who isn't a demented consumer. My netbook hasa full keyboard, HDMI, VGA and USB ports all without paying extra. It runs the full web, and does so on a decent screen size (1366x768) so I don't have to keep pinching and zooming all the time. It has a tonne more storage and can be upgraded if I need more. It can handle more than 4 or 5 websites being open at one time without having to reload from the server. It can handle multiple users giving each their own place to store their files and unique bookmarks or whatever stupid wallpaper they want. It's expandable to 3G by adding a dongle, I don't have to pay a huge sum extra for the privelege (granted a mifi would work with a tablet but how many dumb tablet purchasers are going to know that?). I had a 7 inch android tablet (a rooted nook color in fact) and beyond casual use everything else was such a pain. Multitasking, copying and pasting, hoping a website would render correctly. The advantages a tablet would have I would say would be the battery life and maybe the ease of installing and finding software, but only by a nose. The rest of the benefits I listed put the netbook ahead and either cheaper or around the same price. I'm still rocking an Asus 1000H after 3 years it's still working flawlessly. Does the job what I expect from it. Put an SSD in that thing and I think it would be a very nice cheap system. I wonder how this one or other netbooks (amd and intel based) do gaming and light workloads. With gaming I mean OLDER games, return to castle wolfenstein, dosbox, wolfenstein enemy territory, painkiller etc etc.